It is important to know what is in our wine. We are reposting in case you missed it the first time. Thanks to Pam and her hard work…and for sharing. Here is an eye opening assessment report on the winegrowers ‘sustainability’ meeting by Pam Strayer, a leading specialist on organic and bio-dynamic wines. What impact is that having on farming practices? On the vineyards? I think it’s a fair question to ask Sonoma’s sustainability program leadership if they will – adhering to their stated goals of being “socially responsible” and “environmentally conscientious” – be reducing the amount of toxic chemicals applied to vineyards in the county as part of their program. Today, Sonoma’s growers use quite a few toxic substances for growing wine grapes. Sonoma is far less organic than its neighbors to the north (Mendocino, which is 24% organic) and to the east (Napa, where 7 percent of vines are certified organic). Fewer than 3 percent of Sonoma vines are eco-certified (by a legal standard) – organic or Biodynamic. If you truly wanted to represent yourself as green, why wouldn’t the Sonoma Winegrowers also promote organic certification as a goal for its members? Sustainability – What’s in a Name? While everyone can appreciate efforts by wineries to use natural resources and energy more efficiently – and we do – too often sustainability is more visible in marketing programs than in the vines. But what kind of pesticide requirements do “certified sustainable” wineries and growers have to comply with that others don’t? Most of Sonoma’s winegrowers are using the Wine Institute’s California Sustainable Winegrowing Alliance as their sustainability certifier. This program has no requirements over and above the legal restrictions placed on any farmer (by local, state and federal law) for reducing the use of toxic substances. Nor does the Fish Friendly Faming program, which is a worthy program that helps wineries pro-actively comply with legal requirements (so there’s no surprises when it comes to enforcement). But Fish Friendly Farming (also called Napa Green in Napa County) doesn’t go beyond what the law requires. State and federal laws – that apply to all farmers – include some limitations on pesticides in water discharges, based on protecting fish and groundwater, and on maximum pesticide residue levels on fruits and vegetables. 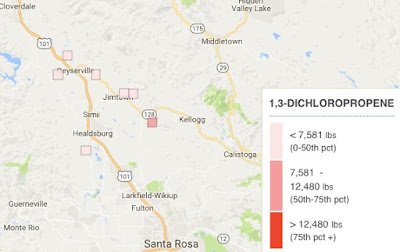 So how well do the “certified sustainable” folks in Sonoma stack up on issues like pesticide use? 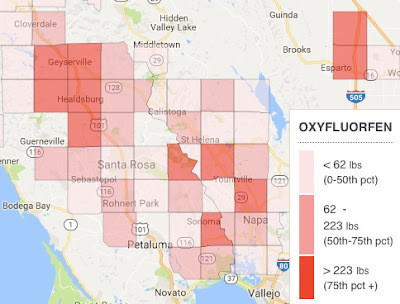 The most surprising thing I discovered when I tallied up the chemicals of concern used on Sonoma’s vines was that Sonoma is the highest user – by far – of an old school, very toxic fungicide called Mancozeb, little used in the rest of the state. 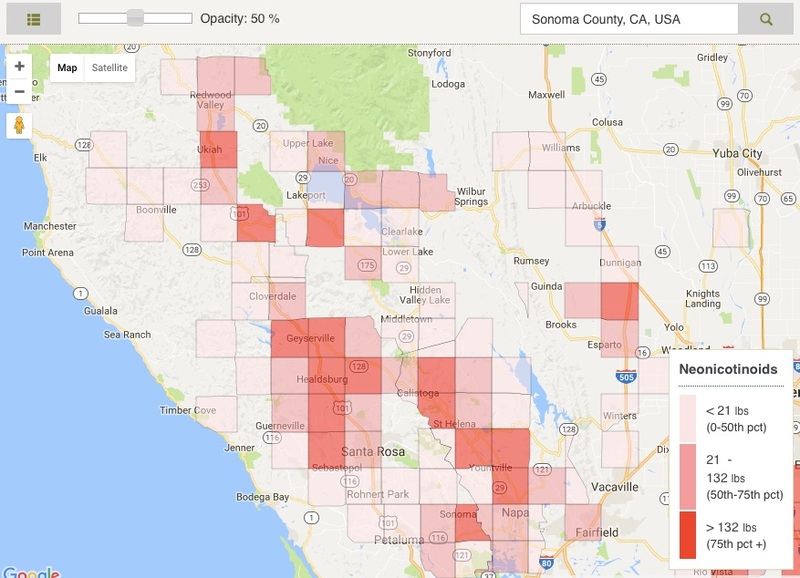 Since 2004, Mancozeb’s use in wine grape vineyards has dropped 50 percent. In 2004 wine grape growers used 25,577 pounds on 19,714 acres. In 2014, that figure declined to 12,284 pounds statewide over 8,079 acres in 2014. 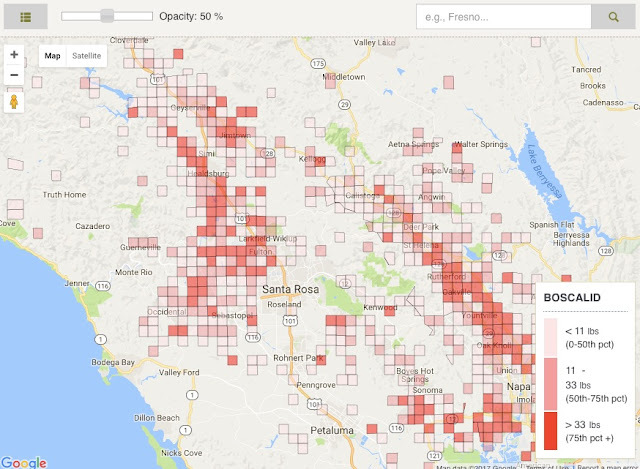 Yet Sonoma growers account for full two thirds of the total Mancozeb used today on California wine grapes, applying 8,148 pounds on 5,246 acres in the county. Why? 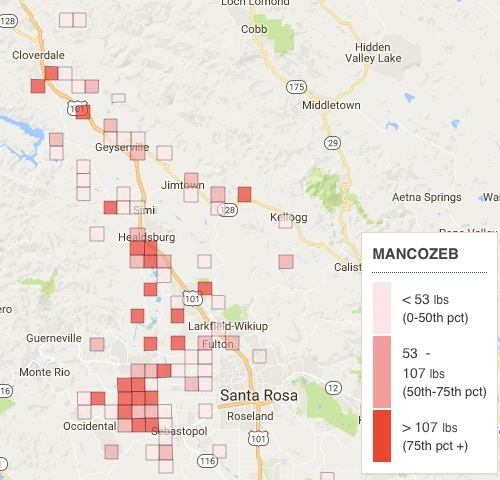 Most of the Mancozeb used in Sonoma County is applied by a few growers and wineries who use Manzate, which is a fungicide that contains Mancozeb. Another product that’s used that contains Mancozeb is Dithane. Note: These three wineries on the list of the top 5 are all “certified sustainable” by the California Sustainable Winegrowing Alliance. Almost all of the applications take place in April. 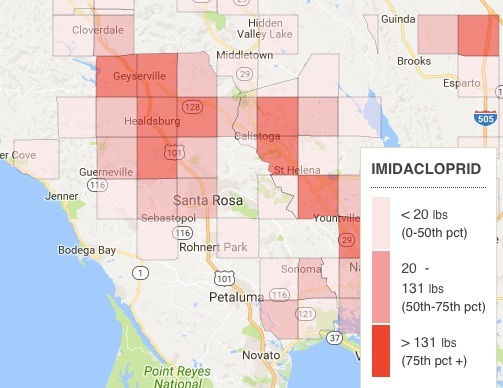 Let’s take a quick tour of Sonoma County’s pesticide use, using the data from the mandatory Pesticide Use Reports, statistics that each farmer is required to file with the state of California’s Department of Pesticide Regulation (DPR). 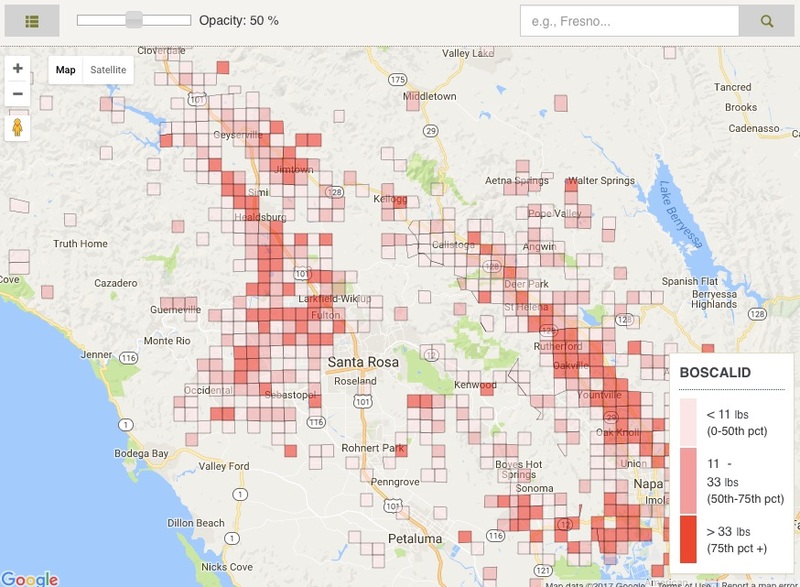 In addition we will take a look at maps developed by the California Dept. 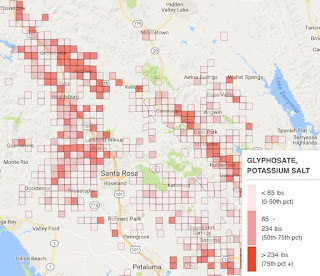 of Public Health that map the DPR data to maps, in the California Environmental Health Tracking Program Agricultural Pesticide Use maps. 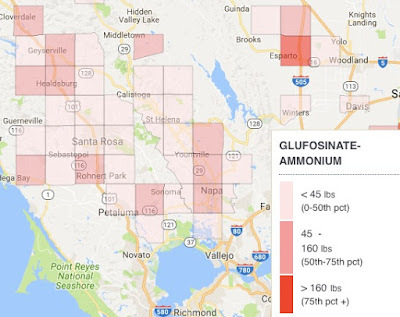 You can read the list of all pesticides used by crop in Sonoma County online here. This page will show you each crop and the chemicals used on that crop. Scroll down the page until you come to “Grape, Wine.” You’ll then see a list of chemical names on the left and other data on the right. Pesticide and health experts single out certain chemicals as being “chemicals of concern.” Here are some of the top chemicals of concern used by wine grape growers in Sonoma (2014 DPR data). The accompanying maps show “summed pounds” for each area and represent only the chemicals used on wine grapes. 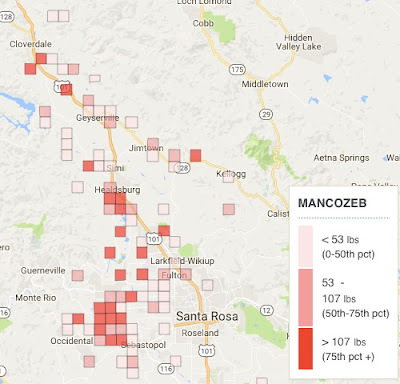 of all Mancozeb applied to wine grapes in California. commonly applied form is potassium salt, depicted in the map. In addition, the pesticide map also displays groups of chemicals – carcinogens, developmental and reproductive toxins and more. 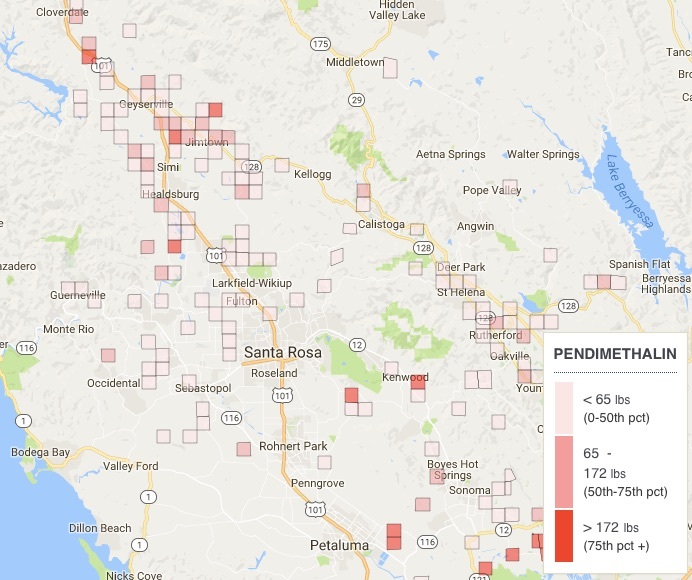 Here are some of the maps showing chemicals of concern in Sonoma applied to wine grapes. This map shows the various chemicals classified as carcinogens. We do owe thanks to the sustainable growers and wineries who go the extra mile to save water and energy and run more efficient operations that waste less. Almost all of the time, though, those improvements result in cost savings. And some of the time, the government offers subsidies and tax incentives to give wineries a helping hand. So when will consumers learn what it means to be “certified sustainable”? And how far will Sonoma Winegrowers go towards helping consumers understand the difference between organic and sustainable? I interviewed David Gates, the highly respected vineyard manager for both of Ridge Vineyards estates – including one in Sonoma and one in Cupertino – for an article in 2014 on the costs of getting certified organic, and in the course of that, I asked him why the winery went for the organic certification. His answer was that organic had clear standards, and “certified sustainable” programs did not. So where’s the trust with “certified sustainable”? For those in the business who know, it creates more mistrust as trust. The organic people think it’s insulting to people’s intelligence. It’s a bet on consumer ignorance and confusion, which are never in short supply. 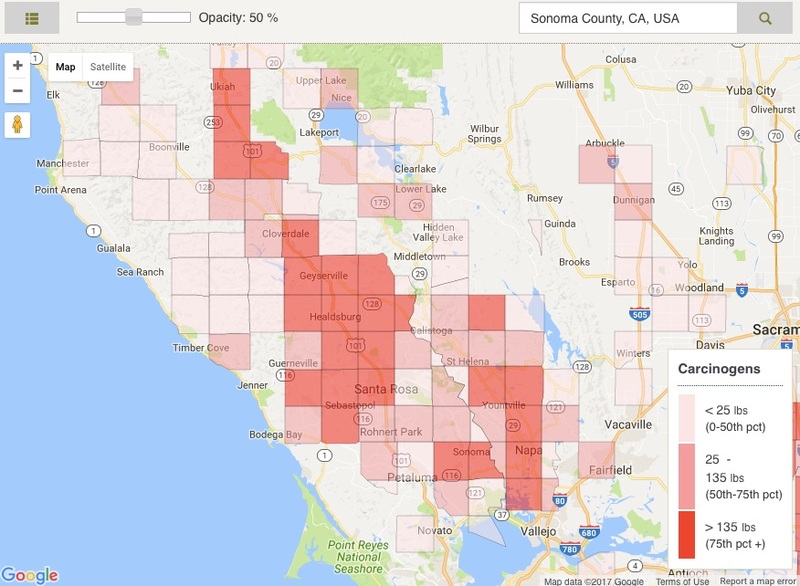 Most importantly, will Sonoma’s move toward “certified sustainable,” have an impact on the land? What will these maps look like over time? Will they change? Or will they stay the same? When will being “certified sustainable” mean more than green marketing?